The wheel has translational motion as well as rotational motion. Because of the rotation, points at the bottom of the wheel move backward with speed 4 ms–1 where as points at the top move forward with speed 4 ms–1. The resultant speed of points at the bottom is therefore zero (4 ms–1 – 4 ms–1) where as that of points at the top is 8 ms–1 (4 ms–1 + 4 ms–1). The linear velocity of the centre of the wheel because of its rotation is zero and hence the velocity of 4 ms–1 due to the translational motion is preserved at the central point of the wheel. The correct option is (b). 10×2 + 8×0 + 2×0 = (10+8+2)v where v is the velocity of the centre of mass. This question is meant for checking your understanding of the law of conservation of angular momentum and for testing whether you can apply it in situations where it is needed. 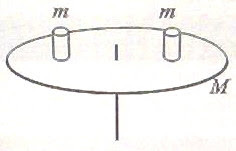 [Note that MR2/2 is the moment of inertia of the disc about the central axis and 2m (R/2)2 is the total moment of inertia of the two masses m and m about the same axis which is distant R/2 from them]. Since the line of action of the force exerted by S1 on S2 passes through the centre of S2, there is no torque on S2. Its spin angular momentum after the collision is therefore zero (same as that before the collision). Since the angular momentum of the system is to be conserved, the angular momentum of S1 also is unchanged by the collision. Hence its spin angular velocity after the collision is ω. The correct option is (b). [We have applied the equation of linear motion, v2 = v02 + 2as (or, v2 = u2 + 2as)]. Therefore, a = (v22 – v12)/2s. α = a/r where r is the radius of the wheel (which is equal to d/2).